Most people spend 2-3 hours at Bigfoot. Action Pass is good for unlimited Gravity Bomb & Super Sling rides for a full day. Adventure Pass is good for unlimited day access to Yeti Fun Zone & Monkey Fun Jump, Gravity Bomb, Super Sling and 8Di Movies for a full day. The legends are true - Branson’s best and biggest attraction, Bigfoot on the Strip, is the premier place to be for family-friendly fun, thrills, and more! Nestled right along Branson’s famous 76 Strip, Bigfoot leaves little to be desired by those who are looking for an amazing time. There truly is something for everyone - from a beautifully constructed mini-golf course, a children’s maze, a vibrant arcade, thrill rides, and a food truck court, Bigfoot truly encompasses Branson’s spirit for quality entertainment. The hardest part about visiting Bigfoot is choosing what to do first. Luckily, there are plenty of options with two different types of passes to ensure you have a fun and tailored experience. About the Action Pass: The Action Pass is the perfect choice for thrill-seekers. This pass includes UNLIMITED Gravity Bomb and Super Sling rides all day. About the Adventure Pass: This pass includes UNLIMITED day access to the Yeti Fun Zone & Monkey Fun Jump, Gravity Bomb, Super Sling, and the 8Di Movies. Thrill rides are the specialty at Bigfoot, and the attraction offers two one-of-a-kind rides that are sure to get your blood pumping. The first of these is the Super Sling. 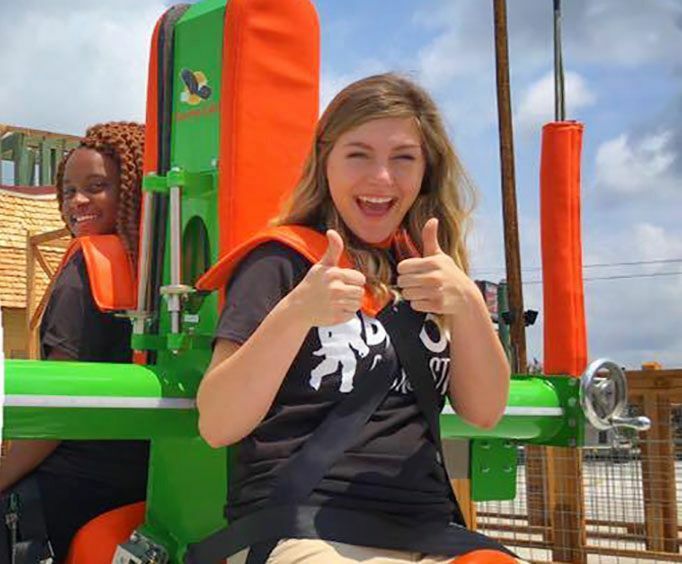 On this springy ride that has been viewed on Facebook over 2 million times, guests will be strapped in back-to-back with a friend. In one fluid motion, they’ll be propelled into the air, strapped to two bungee cords as they spin and spin upside down and around for some dizzying action. Taking tower rides to the next level is the Gravity Bomb. Only the bravest of the brave will be able to conquer this ride. Eight guests will be strapped in as they are moved slowly upward 200 feet for stunning views of the Ozark mountains. Then, once they’ve settled at the top, the gravity is pulled out from under them in a heart-pounding drop, sending them careening back down. 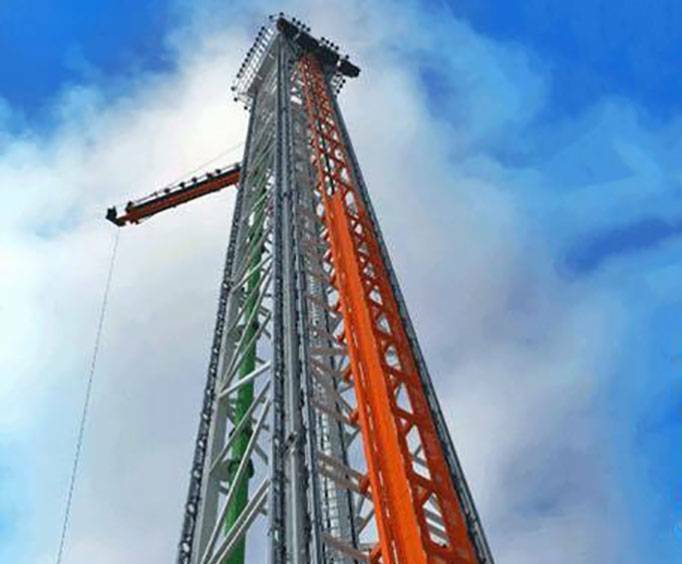 This ride is one-of-a-kind and is one of the only tower rides in the world that is truly a freefall experience. It is powered by earth magnets - no ropes or cords for the best thrill in Branson. Put on your 3D glasses and check out the 4D theater for a unique adventure. There are two movie options - a classic Western shootout and a thrilling zombie hunt. During the Western movie, guests will take out the bad guys in this shoot-em-up game. Then, you’ll have to conquer the apocalypse as zombies try to overrun you and your crew. Compete against friends and family to see who is the best shot in both of these movies. Both also feature state-of-the-art sound effects, 4D moving seats, and stunning visuals for exciting immersion. For those who are explorers at heart, the Bigfoot Maze is a challenge that cannot be passed up. On the surface, it may seem like an ordinary maze, but as you get deeper inside, you’ll realize that it’s much, much deeper than that. Coming upon the first slide, guests will be taken under the main maze into a labyrinth of tunnels that take you all across the Bigfoot playground even under the thrill rides. Can you conquer the Bigfoot maze or will you end up Bigfoot food? The kiddos (and kids at heart) are sure to have a blast. Guests can even watch from a bird’s eye view from one of the Bigfoot Observation Points which are positioned over the maze. 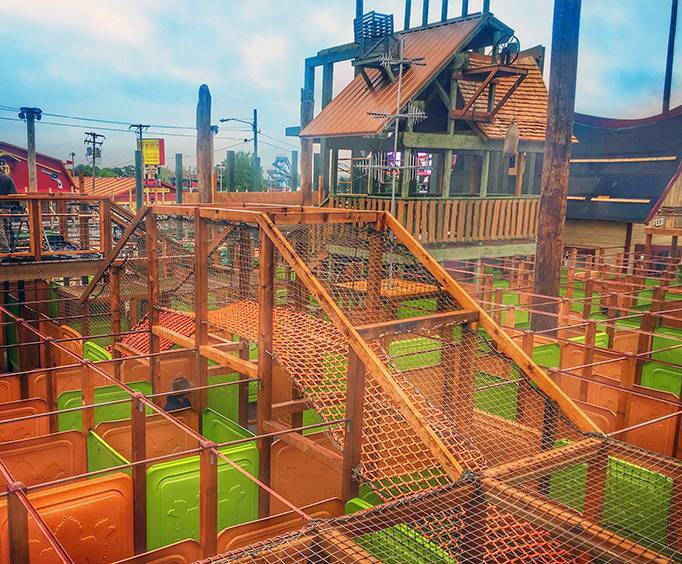 Other features of the maze include a spiral slide, rope bridge, and, to really get your heart pumping, climb to the top of the Monkey Jump, where you’ll dive off a 10-foot platform into the squishy padding below. With so many different things to experience at Bigfoot on the Strip, you definitely want to put this brand new attraction on your Branson itinerary. Whether you want to conquer the Gravity Bomb, hunt for Bigfoot in the maze, or check out an 8Di movie, you’ll find no better family-friendly environment. Then, top your evening off with one of the free light and sound shows. Come see what the legends are all about in person at Bigfoot on the Strip! The Bigfoot on the Strip Action pass includes unlimited day access to the Yeti Zone and Monkey Fun Jump, Gravity Bomb, Super Sling, and the 8Di movies. The Bigfoot on the Strip Adventure Pass includes unlimited day access to the Gravity Bomb and Super Sling for one day. What is included in the admission price for Bigfoot on the Strip? The Action Pass includes unlimited Gravity Bomb & Super Sling rides for a day. Adventure Pass features unlimited access to Yeti Fun Zone, Monkey Jump, 8Di Movies, and rides. Approximately how long could a customer plan to spend at Bigfoot on the Strip? Most visitors spend approximately 2 - 3 hours here. There is an arcade with a prize shop. Is Bigfoot on the Strip handicap accessible? For what ages is Bigfoot on the Strip appropriate? Is parking available at Bigfoot on the Strip? Is it free?